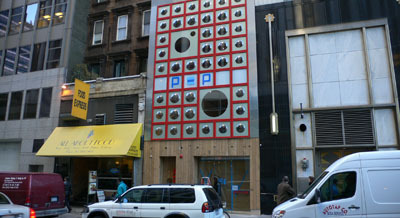 Opening in time for the 2002 New Year right in the heart of the Theater District to witness the annual 'Ball Drop' in Times Square is the latest W Hotel. The W Times Square represents the largest AV system in the W Hotels series. 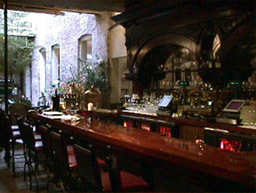 Starting with The Whiskey on the cellar floor which is an all encompassing bar, nightclub, and theater. The theater is a new venue for W Hotels and they went for the real thing; a state of the art, 16ft wide by 9ft high, high-definition rear-projection system with a Barco SLM DLP projector. Complete with JBL speakers, 7.1 surround sound and digital processing from BSS Soundwebs, the theater is fully integrated with the two stereo systems in the bar and lounge that are run either by the TRDJ system or a live DJ. The fully equipped DJ Booth includes both dual vinyl turntables (Denon) as well as dual CD turntables (Pioneer). Acoustic treatments to the walls and ceiling were also given high priority to turn the concrete cellar into a definitive listening space. 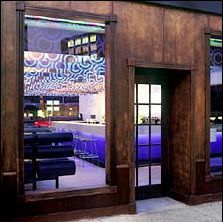 The first and second floors are comprised of the Blue Fin restaurant. 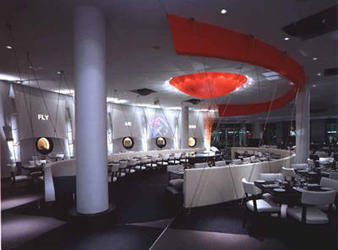 In addition to live piano and jazz, the restaurant is also run by a second TRDJ system. 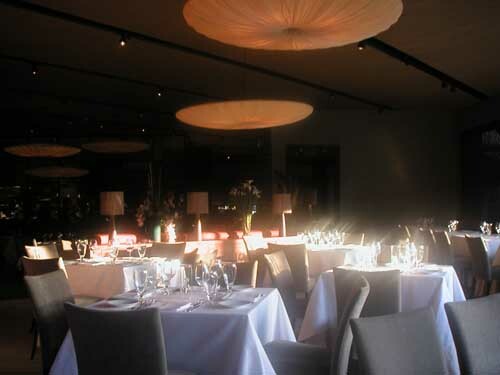 The full complement of Speakercraft in-ceiling speakers creates a seamless background music system ideal for dining. 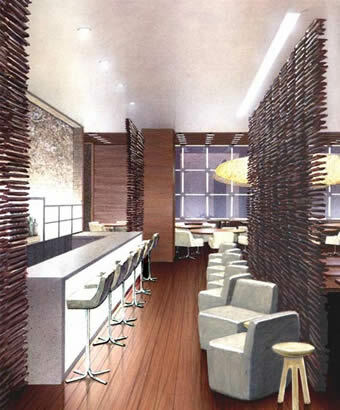 The seventh floor is W Times Square's main lobby with bar and lounge area (shown below). 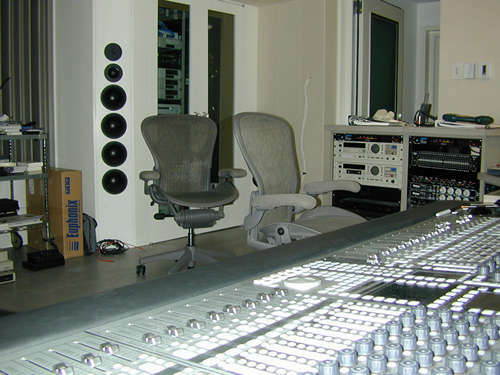 Dig It Audio is a sound design, music and mixing facility for the television and film industries. Their credits include the films High Art, Moment of Impact, Station Agent, Assisted Living, and Happiness, among others. 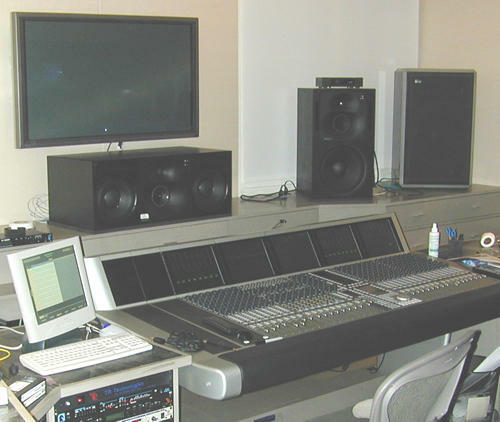 In addition to their recording, live, editing and mixing studios, they've added a main post-production room with a Pro-Tools ProControl surface. 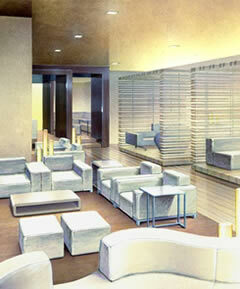 TR Technologies designed the audio and video system for this space which was then Dolby Certified. The video display is a 13ft diagonal, 16:9 ratio cine-perf screen hiding the front-center-right speakers and dual subwoofers from the JBL Cinema Series. Providing the video is a Sharp XV-Z9000U DLP projector. Check our Recent Press section for articles about Dig It Audio. The expanding series of the highly successful W Hotels across the World are stepping up their Audio quality and requirements to match that of their interiors and services. TR Technologies has been given the challenge to do just that for ten of their new sites. These new sites all feature the TRDJ system that runs all of the Hotel Audio and Meeting Room systems. The W Hotels focus on providing an environment that "creates a new home for the young, creative business traveler." Most feature the hip bars run by Rande Gerber of the Midnight Oil Company, such as Cherry, Wet Bar, Under Bar and the relocated Whiskey in the recently opened W-Times Square; all designed with unique sound sytems by TR Technologies. Chef Tom Colicchio of the renowned New York restaurant Gramercy Tavern has set out on his own with the March 2001 opening of Craft. Wanting a more sophisticated background music system, Mr. Colicchio has asked TR Technologies to design a high-fidelity system that enhances the dining experience by optimizing the musical environment. 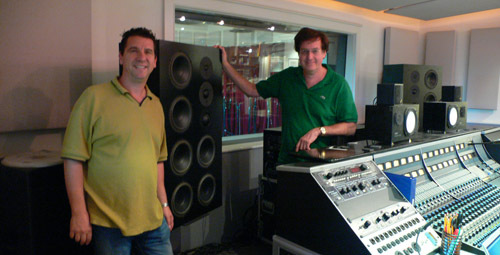 The use of Symetrix's 571 SPL Computers to adjust and track the music volume automatically to the ambient crowd noise ensures that the appropriate music level is always as it should be. Nestled in the Corner of Jackson Square in the middle of the French Quarter in New Orleans, Muriels restaurant has been launched in the grand tradition of authentic New Orleans. Muriel invites the diner to be her guest at their interpretation of a Chateau. The restaurant is divided into five private dining rooms where instead of reservations per table, the evening is divided into group seatings per dining room. Employees play the part of house servants and butlers more than waiters. 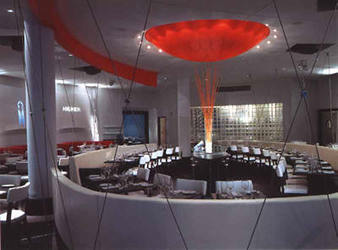 TR Technologies has designed the music to create diverse ambiances throughout the restaurant. 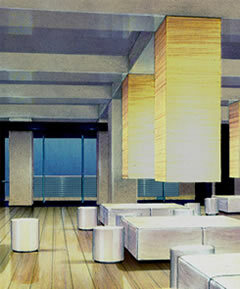 The use of multiple audio sources enables each dining room to become a unique and personal experience. Movie Scorer Carter Burwell's Composing Room is a showcase of the latest in recording and production technology, including a Euphonix System 5 Digital Console, a Pioneer 50" Plasma TV and a custom set of TR Techs' 4-way rear speakers. 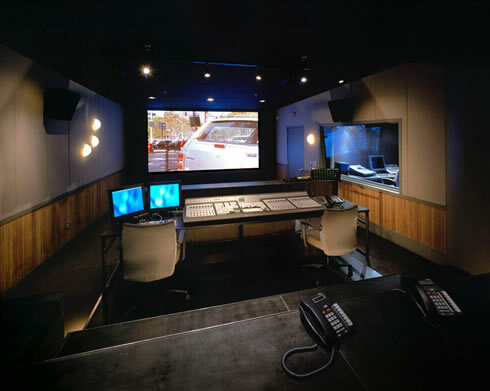 TR Technologies was responsible for the complete design, integration and installation of audio, network, video, recording, telephone, and electric shades for the studio and the adjoining residence. After many unsuccessful attempts by various experts, Ed Van Halen had almost given up hope getting his main studio control room monitor speakers to a point where they could be really trusted. Then, he heard about a statement Roger Waters made some years ago: "If you want your monitors to be right, just call Ted Rothstein and do whatever he says." 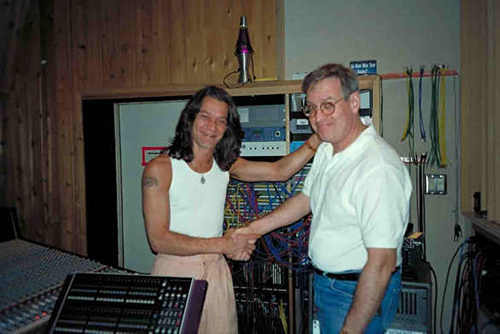 Ted then spent a few days in July 1999 modifying and tuning up Eddie's existing system. Ed and his engineers simply couldn't believe how good Ted made it sound! Ed said to Ted: "Now I know why they call you 'soundGod'!" 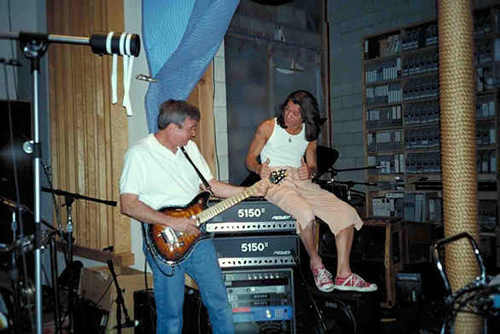 Ed & Ted in 5150 Studios. Jaguar Records has released the first CD from singer/songwriter Janice Grace, almost entirely produced from its private recording studio created with the assistance of TR Technologies. 23. is the latest restaurant project by ex-NBA megastar Michael Jordan in Chapel Hill, North Carolina accross the street from his Alma Mater, the University of North Carolina. TR Technologies designed and installed the entire Audio/Video system as well as the lighting for the restaurant; including the main dining room, private party room, bar and retail areas. The highlight of the Audio system is the TRDJ CD automation system that is the hall-mark of TR Technologies' designs for restaurant & club projects.